One job that needs to be done on any dig site is screening dirt. Contrary to popular belief, archaeologists don’t sit around with tiny brushes and tools slowly and carefully digging all the time. Sometimes we use hand picks and trowels or even pick axes and hoes. It depends on the job that needs to be done. Consequently, in order not to lose valuable information and artifacts, every bucket taken out of a site must be screened or as they say in Israel, sifted. So what does that entail? There are different types of screens, some are on tripods and can be used by one person. 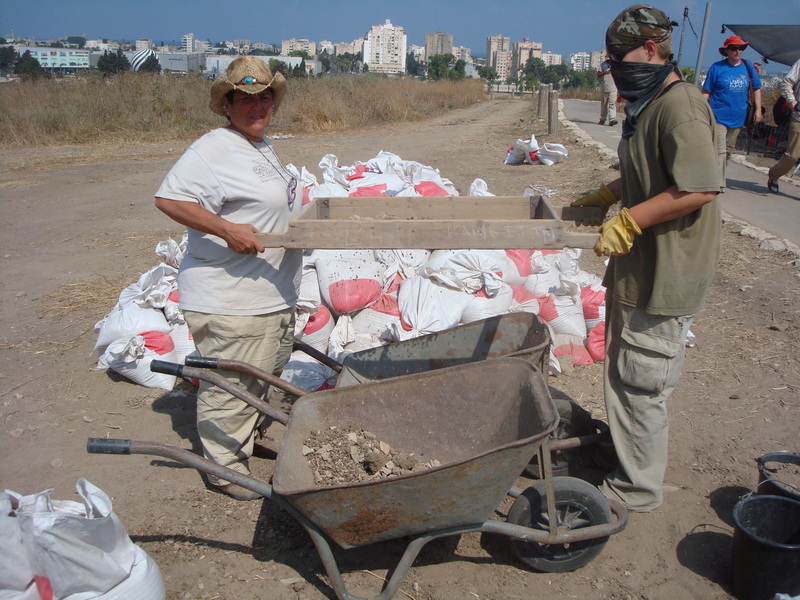 Or others are rectangular screens with legs for one person, but at our dig at Tel Akko, we have the two-person kind that is used over a wheelbarrow. So, dump the bucket in the screen, remove any big stones, shake the screen back and forth to remove the silt, dust and dirt, and paw through the remains. In the process, dust covers every part of you. Some people wear sunglasses to protect their eyes, gloves to protect their hands and a bandana over their mouth. I don’t use any of those and screening doesn’t really bother me except when we find little yellow orange centipedes in the screen. They are poisonous. Not cool. A’ndrea Messer and Jessica Wells, both of Penn State, screening dirt. One never knows what is going to pop up in the screens. Tiny little scallop-like shells with pierced holes, tons of pottery, ancient glass, pieces of flint. All get collected and popped into the proper bucket for the assigned locus number and turned into the registrar who numbers, codes and orders everything we find and bring out of the field. After screening a number of buckets, the screened dirt must be placed into plastic sandbags, which are earmarked for propping up walls and other areas for the close of the dig. But here’s my secret. I really like screening. That way I get to see all the artifacts, pull them out of the screen, decide if they stay or go. Know if they need a special finds bag or if perhaps they will win the “find of the day.” It is hot dirty work. In the sun rather than under the shades, but, the reward might just be worth it. A shell bead here, a beautiful rim, baby scorpion, centipede or grub. Nearly anything can appear in the sift.